It was an Eggstravaganza at this month’s FBLA meeting. Kim from Rustic Garden Bistro hosted us the meeting and Davidson’s Safest Eggs sponsored the event. I first became acquainted with Davidson’s last fall. Their eggs are pasteurized which makes them very safe for those with a comprised immune system. You can feel comfortable making recipes that contain raw eggs, like Caesar Salads. Remember the Green Eggs and Ham Popovers from last month to celebrate Dr. Suess’s birthday? Back to our Eggstravaganza. My friend Louise, of Geez Louise, gave a demonstration on Mac and Cheese while we talked about recipe development. It’s fun to hear how others develop their recipes. Then it was time to eat. Never a lack of food at a food bloggers meeting. I brought Baked Lemon Buttermilk Donuts that were divine. 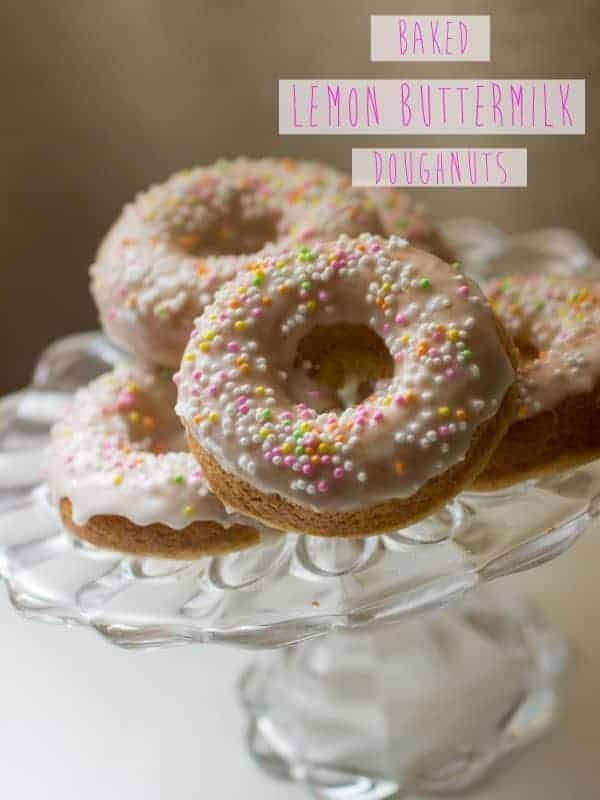 They are made with yogurt, lemon and lemon zest. They are light and healthier than the fried, but oh so good, variety. A few weeks ago I taught a demo at Surfas Culinary District in Costa Mesa. I was a bit nervous and it only grew when I walked in and saw that sign! It was the day before Easter so I was thinking the class would be small. Luckily, I was prepared because there were close to 100 people there. We had fun talking about Healthy Mexican and sampling Fish Taco’s and Mango Brie Quesadillas. Ok, so maybe only the Taco’s and Salad were healthy! I have lot’s of little things planned for the Mom and Me class. It will be a special time. Dad’s are welcome too! You can reserve your spot on each of the class pages. I would love to have you join me. We will have a great time! Look for a giveaway later this week. To see the other recipes from Saturday’s Eggstravaganza you can see them here. Preheat oven to 325º. Lightly grease two 6 count donut pans with cooking spray or vegetable oil. In a medium bowl, whisk together flour, sugar, baking powder, baking soda, and salt. Set aside. In a small bowl, whisk together egg, yogurt, oil, buttermilk and lemon zest. Add to dry ingredients and stir just until combined. Bake for 10-15 minutes, until a tester inserted into the center comes out clean. Remove from oven and cool for a few minutes in the pans. Whisk together powdered sugar and lemon juice to create a thin glaze. Remove donuts from pans and dip into the glaze. Sprinkle if desired with colored sprinkles. Cool on a wire rack.